Boo has wanted her own water bladder and tube since forever. For Solstice she got a 1/2L Platypus. Only problem? Her orange bag was about an inch too short for it to fit well, so we had to not fill it fully and roll the bottom end a bit. So Lee was shopping in Chicago (a tea- seeking trip I believe), and Boo and I were plotting her next backpack, when the phone rang. We discussed. Her hands-on impression, my looking at the website and reviews. Boo was immediately thrilled. “There’s room for so much more stuff! !” Of course, the thing we were most concerned about was this bag is big enough to carry more weight than she should carry all day. 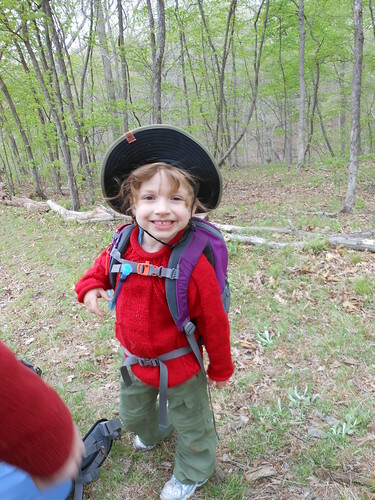 12L holds her first aid kit, field guide, binoculars, bike gloves (protection against scraped hands), bandana, hat, raincoat, snack, and water easily. If we stuff her sleepingbag directly into the pack it fits, but nothing else will. It’s shaped so it’s deeper at the bottom (below the zipper), and tapers to the top. 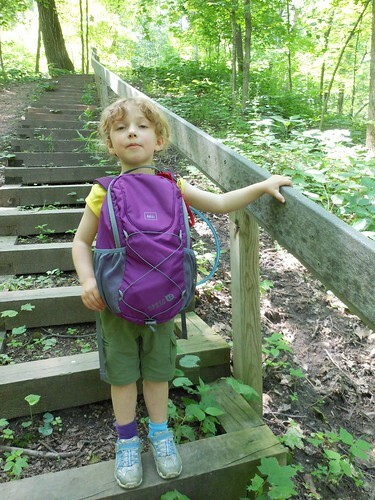 If your kiddo, say, wears her backpack backwards and opens the zippers while bouncing down some stairs, much less than half the stuff will spill all over the trail. It has a two-way zipper. The hydration pouch is just like a larger pack. Nothing fancy. The hanger loop is just a loop, not a clip like our big packs. There is one tube hole on the right. The seams are all finished like you’d expect from a quality pack. It has good hand-feel. The shoulder straps are cut in, so they don’t fall off tiny shoulders. The right has 2 elastic loops for a hydration hose. They are nicely padded and backed with mesh. The sternum strap adjusts up and down with sliders, and has a whistle built in. That kind of whistle is too small for her, at 4, to blow without covering up the noise hole, but it’s a nice touch. The hip belt is just 1” webbing, but it has a double-pull. It does carry some load if she wears it actually tightened down, but she generally just clips it. She likes to be like the adults. There are little pockets the hip-belt can tuck into if your kid doesn’t want it. We could probably cut a foot off each strap and it'd still fit her until she outgrows the pack. The back is a foam board with a nubby surface toward the wearer. This is covered in mesh. There’s a gap between the lower and upper back area. The top grab loop is smaller than on an adult pack, but still large enough for an adult to grab easily. As a bonus, the straps have enough webbing to lengthen enough for an adult to carry it. I put some shockcord loops for it on my pack. There are two roomy mesh side pockets. Boo generally puts found items there, as she can reach them with the bag on. I’ll often put her hankie there so I can get to it quicker. They haven’t been damaged by snagging yet. There is a shock cord on the back. It runs through 4 loops and one grommet. This arrangement has the cordlock on the bottom and you can’t turn it over without cutting off the pull-tab. But it is a nice place for her jacket or a stuffed animal. She's 4-years-old, ~35 pounds and 41" in the pics. The harness has a lot of room to grow. The pack is a bit long for her yet. It's got lots of room to grow. It can fit her clothes and snacks and her "essential" hiking gear for a weekend. The purple color is not highly visible. The red is not much better. I much prefer bright orange or construction yellow for better kid visibility. While this isn't a con for me, this is a hiking pack, not a school pack. It would be a really bad school pack for a myriad of reasons. I'd like the shockcord to pull tighter on the top, instead of the bottom. Boo likes it a lot. She willingly carries it all day. I expect her to outgrow it before she wears it out. She took a picture of it on our last backpacking trip. 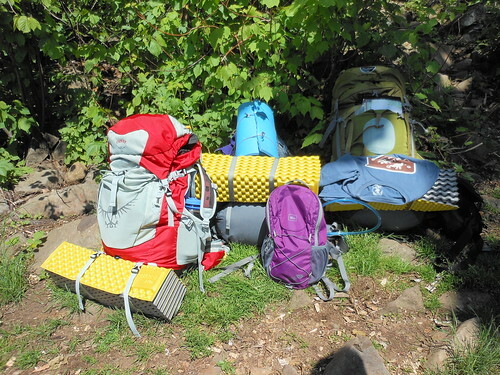 What pack do your kids use?